I still chortle to myself when I think how I got in on the "ground floor" of Monique Dupre's sustainability-on-a-budget workshop series. I took her two-hour introductory session for only $25, in my friend's packed living room! Ahh, those were the days. Now her workshops, which cover strategies for meal planning and cooking with whole grains, making sauerkraut and mayonnaise, and cooking with local, seasonal produce, go for $35 or more. 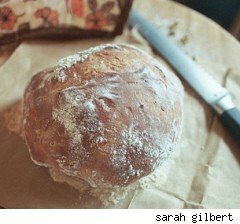 Now I'm hoping to find the cash for a session of my friend Chris Musser's series of classes from her 'Lost Arts Kitchen' on how to buy in bulk and cook from the pantry; how to make cream cheese and yogurt; and how to bake sandwich rolls, bagels and pies. They're $40 each and well worth it (can you just imagine how much money you'll save?). Another woman I admire greatly, Harriet Fasenfest, is teaching a series on how to go from seed to pantry -- growing your own food and putting it by. Not only are people starting to panic in this economy, cutting out pricey restaurant meals and packing their own lunches; but rising concern over toxic corporate food is scaring many Americans away from the grocery store. Where there is a problem (most of these Americans weren't taught how to knead bread and can tomatoes in mom's kitchen) savvy, homey entrepreneurs can see an opportunity (teach a man to fish, bake bread, or scavenge for wild greens). The upfront costs are tiny; you can teach classes in your own kitchen or, if you've got a tiny/messy/out-of-the-way kitchen, in your clients' homes. There are no licensing requirements -- not even a food handler's permit is needed. And, if you're the sort who would happen upon this idea, it's likely you'll be doing something you love, and furthering the cause of slow food while you're at it. And best of all, you won't have to break for lunch.